The hilarious Maya Rudolph had an interview where she talked about her life, the laughs she delivers every day and yes wigging out. She talked about her progress in the field of Hollywood as a comedian. Her witty answers will leave everybody pondering and laughing all at once. The Lakers fan, Rudolph grew up in LA and was brought up by mother Minnie Riperton who was a singer and father Richard Rudolph who was a singer and songwriter. Maya goes down he memory lane and talks about how she recovered from her mother’s death at the tender age of three and went on to become a comedian. Maya furthermore talks about how she went on various tours to conduct entertainment projects, voiced in animated movies like Angry Birds and Shrek. Maya has also been significantly affected by SNL which was the gateway to her success as a comedian and actress. She recalls after leaving SNL that the ‘dress up’ was the best part of the show. Maya reveled also that her inspiration towards all the laughs that she has helped deliver from her audience comes from Gilda Radner. She was also madly in love with late Gene Wilder who was one of the best actors and comedian of all time. Rudolph’s life does seem like an actual roller coaster ride placed at a wild setting. The mistress of disguise, Maya has not only played roles requiring her to act as a different ethnicity but has also worked with wigs. She has been wigging out playing people like Oprah Winfrey, Paris Hilton, Tyra Banks, and more. All of the roles are convincing and give us the ultimate laughs. Can she be any more interesting? Maya revealed that like everybody she is fond of music. Since havng grown up in an environment where both her parents were singers, Maya attached herself to music. Maya also went on to appear on NBC’s Maya & Marty with SNL’s icon, Martin Short. Their show has been a hit and music seems to have played an important role in her joining hands with Martin. 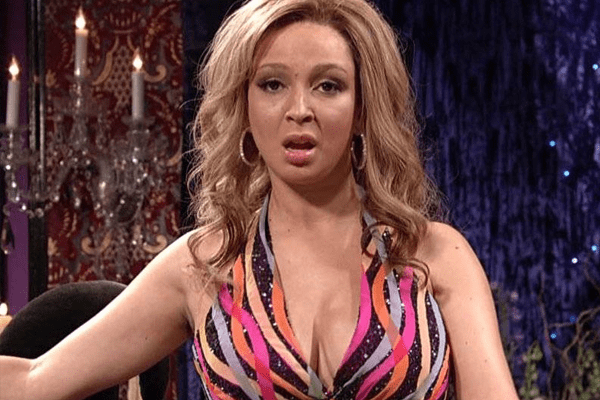 The mother of four, Maya Rudolph has perfectly balanced her personal as well as professional career and still manages to looks as youthful as ever. The mischief maker has us rolling on the floor laughing with her hilarious acts on TV. She is one of the most celebrated and decorated female comedians of all time.